This is such an amazing bronzer it gives you a healthy natural glow without making you look like a tangerine! It comes in 5 different shades I went for light as I have quite a fair complexion and I can honestly say its brilliant! When I first switched to this bronzer my friends and family started to comment on how good my skin looked- personally I wouldn’t say my skin is anything special but they were all saying how it gave me a warm, natural complexion. This product is very easy to use and is great for all occasions, I would personally recommend this to anyone and I will be defiantly be buying this again. You only need a small amount of this bronzer to get that healthy summer glow that you want. Its perfect for adding a hint of contour or sun kissed tan its also perfect for all skin types and tones as there is a colour to suit everyone. It has a nice matt finish and is perfect for all year round. I find it best to apply this bronzer in a C shape from my temples to just underneath my cheekbones, I would recommend using either a powder brush or contour brush but any bigger brush will do the trick, you only want to use a small amount of the bronzer to make it look natural. For just £8 this is a great value bronzer as It last ages even if you use it every day, this bronzer if perfect for those of you who want a healthy glow all year round. 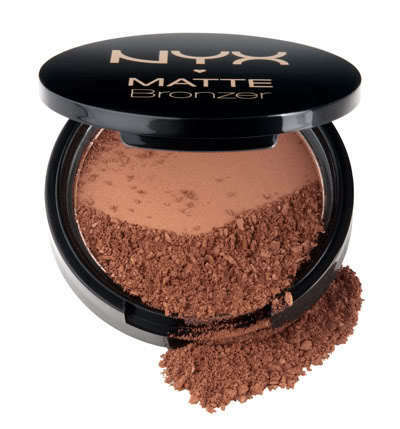 This bronzer is available from NYX.